I LOVE lemon chicken! And this is not very unhealthy, even if it is fried, because the fats are divided between butter and olive oil. Just try it and I think you will like it very much. Unless you hate lemon. Like my daughter. Then you will gag and your eyes will roll into the back of your head as you spasm to the floor. 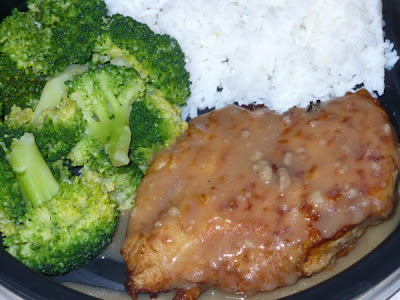 Pound chicken breasts with meat mallet to a uniform 1/2-inch thickness. Dredge lightly in flour, reserving excess. In large saute pan, over medium-high heat, melt butter with oil until it sizzles. Add chicken breasts and cook 4-5 minutes, turning over once, until juices run clear. Remove chicken to serving plate. Stir 1-2 Tbsp. reserved flour into saute pan. Whisk in broth and lemon juice; heat to boiling. Boil 1 minute to thicken slightly. Season to taste with salt and pepper. Pour sauce over chicken as desired. Serve with white or brown rice. are you sure it wasn't the broccoli that made her fall down?